Easy email reminders without leaving your inbox. Boomerang for Gmail is a powerful extension that lets you schedule easy email reminders right from your inbox. Boomerang is the best thing that's ever happened to my inbox. Thanks so much Baydin for building a killer product! Use Boomerang to take messages out of your inbox until you actually need them. At the time you chose, we'll bring it back to your inbox, marked unread, starred, or even at the top of your message list. While this function is certainly useful to remind ourselves about stuff that is weeks or months away, sometimes when those messages bounce back, we realize that we had no idea why we wanted them in the first place. 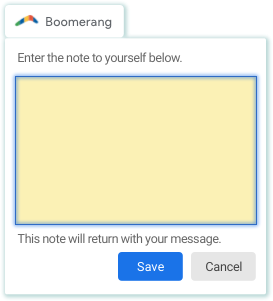 You can now attach a note to the message as you schedule it with Boomerang. When the message returns to your inbox at the time you specify, your note will be appended to the email thread. Boomerang! Where have you been all my life? Boomerang for Gmail. First off, if you don’t have it, stop reading this and go get it. Right now. There’s absolutely no other plugin that will add this level of function to your Gmail.